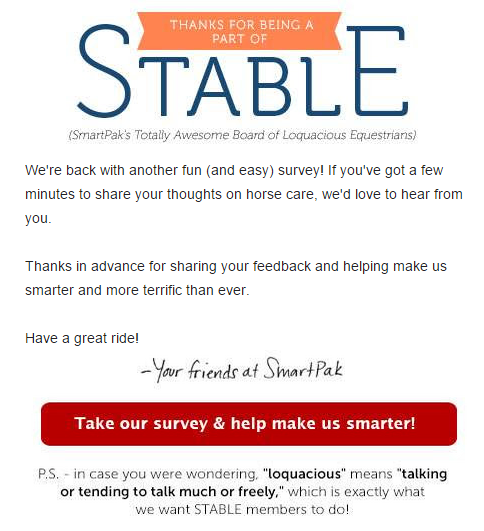 Some months back, I got an email from Smartpak asking to be part of a…focus group? really large study? ongoing feedback loop? Every few months, they send out a short survey. It’s really, really basic. So far anyway. I think it’s meant as really high-level strategy, to figure out gaps in their product line. The screencap is an email I got a few days ago. I clicked on the link. I am a sucker. I’ll be honest, I signed up 95% hoping there would be compensation down the line (even a random drawing), 4% out of curiosity, and 1% because I genuinely wanted to contribute opinions. I’ve taken every survey they’ve sent me so far. Did anyone else get invited to be part of this? Did you say yes? I’m curious as to how many people really are on this list. I got that email and I also signed up! I mostly signed up because I like to keep an eye on what the big tack stores are doing and what strategies I can implement at work. And because I was hoping there might be a coupon somewhere down the line. I am a part of it, I'm also a top reviewer on the site. I also always hope for some kind of generous compensation but alas. I fly under the radar. I joined STABLE a while back, also hoping there would be some kind of discount involved as well. But, I love me some SmartPak, and I love to give opinions, so I would do this even if there wasn't a discount involved! I got that email and deleted it because there was no discount/prize to be had. Ditto the above. I got the email and deleted it. I haven't been super thrilled with my recent Smartpak encounters so I am probably going to be avoiding them for future purchases. I'm not in their group AND now I'm jealous. I'm in the group but I always forget to go back and fill out the survey. I signed up for the same reasons: thinking there would be extra discounts or some sort of similar perks down the line, but so far nothing. While we're on the subject: Smartpak's sales lately are worse than Dover's. It's a huge change that's happened over the last year, at least (that I've noticed). Usually the only things on true sale arethe Smartpak brand products, even when they advertise a store-wide sale. I almost fell for their Black Friday/Cyber Monday sale last year and was astounded when I saw the long, looooooong list of brands excempt from the sale. The only thing I order from them currently are my supplements, and only for convenience's sake. If Platinum Performance weren't more expensive, I would've moved on to them a long time ago.